bbc.comOne name will reverberate around Augusta National this week, but a host of competitors are looking to creep quietly into contention in what could be one of the most open Masters in recent memory.The faces on the tee box may change, but the unmistakable allure of the iconic course and its manicured fairways and blooming azaleas remains.Yet this year there is an added buzz, one that follows Tiger Woods on his return to the Masters field for the first time in three years. 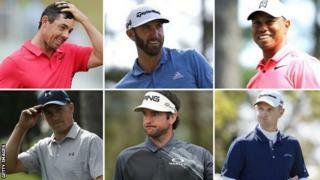 Having shot to world number one in the run up to Augusta last year, Dustin Johnson's hopes of a first Green Jacket quickly evaporated as the American injured his back in a fall at his rented home.Johnson tried to take part in the tournament, but walked off the first tee on the Thursday without playing his shot and withdrew.The 33-year-old, the 2016 US Open champion, still holds the number one spot having added two PGA Tour titles to his name since that slip 12 months ago.Three of the world's top four are American, with last year's US PGA Championship winner Justin Thomas and 2017 Open champion Jordan Spieth completing the contingent.A spectacular final-day collapse from Spieth handed Englishman Danny Willett the Green Jacket two years ago, but the Texan's record at Augusta is generally impressive.Two second-place finishes sandwiched the 24-year-old's victory in 2015 and Spieth, who came 11th last time, is looking for his fourth major success. England's Justin Rose had to settle for a second runners-up spot in three years as he lost a play-off to Sergio Garcia in 2017, letting slip a one-shot lead with two holes to play.The 2013 US Open champion has never won at Augusta, but has enjoyed four top-10 finishes in the past six Masters and has the best score in relation to par at the tournament since 2011. "After losing in the play-off it was just important just to come and walk the grounds," said Rose after arriving at the course earlier this week. "The two weeks after last year I didn't really want to play golf. I was kind of licking my wounds a little bit, but I really have positive and fond memories of last year. "I hit a lot of great shots. I don't feel like it was a tournament that anybody lost, really. It was great to be a part of an exciting Sunday back nine with birdies and eagles. "Bubba Watson, who clinched the Green Jacket in 2012 and 2014, was considering retirement 12 months ago after suffering with an undisclosed health issue.But now the American is back, winning both the Genesis Open and the WGC Match Play event this season to end a two-year run without a title. "Seven months ago I did not believe it," said the left-hander about arriving at the year's first major with two wins in the season. "My team around me, they have cheered me on and they have helped me come out of a dark place. "And, again, life's in the right spot, and golf's in the right spot. Golf is really easy when you free it up. It's very difficult when you're not thinking properly. "Spaniard Jon Rahm who has sneaked up to the third in the world rankings, and Japan's Hideki Matsuyama are also worth keeping tabs on, while American Brooks Koepka is the reigning US Open champion. A first Masters appearance in three years, 13 years since his last Green Jacket and no major victory in a decade, but the sight of Woods' name at Augusta National has got the golfing world salivating.It was 1997 when a 21-year-old Woods became the tournament's youngest winner, scooping his first major in the process and setting the stall for a glittering decade that followed.The American won three Green Jackets between 2001 and 2005 as part of a haul of 14 majors, the last of which came at the US Open in 2008.Woods feared he may never walk again after spinal fusion surgery last April - his fourth back operation in three years - but has hit form with finishes of 12th, second and fifth in his past three starts on the PGA Tour.Asked about trying to get ready to play the Masters in 2016 and 2017, the former world number one said: "In hindsight, it was a pipe dream. "My back was fried. I tried cortisone shots, epidurals, anything to take away the pain, so I might be able to withstand a week. Nothing worked. My disc was gone. "British three-time Masters winner Sir Nick Faldo thinks a Woods victory this week would be the "greatest comeback in sport".When asked for his thoughts on that, Woods replied; "I have four rounds to play, so let's just kind of slow down. "I had a similar build-up in 2000 to 2001, what that tournament would mean, but it's the same thing. I have got to go and play and let the chips fall where they may." Winning the Green Jacket would propel the 28-year-old into exalted company alongside Jack Nicklaus, Gene Sarazen, Gary Player, Ben Hogan and Woods.And, after four consecutive top-10 finishes at Augusta, the world number seven has made no secret that finally sealing victory is his main priority. "I can be as prepared as I possibly can be - but I can't be robotic," he told BBC Sport. "I need to have fun, play with a smile on my face, that's when I can play my best golf, play freely and let my subconscious take over, rather than over-thinking it." Sergio Garcia served up his champions dinner on Tuesday; now the Spaniard is ready to try to defend his Green Jacket.Garcia won his first major title at the 74th attempt last year, beating Ryder Cup team-mate Justin Rose on the first hole of a sudden-death play-off. "As a Masters champion it's a different feeling and it's unbelievable," said Garcia, who is bidding to join Nicklaus, Faldo and Woods in claiming back-to-back victories at Augusta National.For his dinner, the 38-year-old opted for an international salad which combines ingredients from several countries of past Masters champions to start, followed by Spanish lobster rice and a desert using a recipe of his wife Angela, a tres leches cake.It has been a busy 12 months for Garcia, who also witnessed the birth of daughter Azalea, appropriately named after Augusta's 13th hole. "I'm enjoying every minute of it and hoping I can go out there and play great again and have the chance to defend the Green Jacket," he added. The chatter may surround Woods, but it was England's Paul Casey who beat the returning American recently to end a nine-year drought on the PGA Tour with victory in the Valspar Championship.The 40-year-old has recorded nine top-10 finishes in major championships, with five of them coming in the Masters and three in succession, including a tie for fourth in 2016.Willett collected the Green Jacket that year, but the Englishman has struggled to rediscover his major-winning form since.And then there is Ian Poulter. The 42-year-old sensationally snatched the last available Masters spot with a dramatic play-off victory at the Houston Open last week.McIlroy is the only Northern Irishman taking part, while Scotland's Sandy Lyle - 30 years after that bunker shot - and Wales' Ian Woosnam make their annual return as former champions. bbc.comHaving made his Masters debut last time out, Tommy Fleetwood returns to Augusta as Race to Dubai champion and is joined by fellow English hopefuls Matt Fitzpatrick and Tyrrell Hatton.Harry Ellis, 22, won last year's Amateur Championship final at Sandwich, earning a place at The Open at Royal Birkdale the following month and a berth in this year's Masters and US Open. "I've seen that very few amateurs have done well here over the years, it usually takes that period of time to get to know the course, but I believe in my ability and I think I can definitely play well here," said Ellis, who played Augusta several times during his final year of a sport management degree at Florida State University.Since current Masters champion Garcia finished in a tie for 38th in 1999, Italy's Matteo Manassero and France's Romain Langasque are the only other amateur champions to play all four rounds of the Masters. One of the most ominous yet anticipated stretch of holes in golfSeeing the sign pointing towards Amen Corner can strike fear into the minds of even the world's best golfers.Amen Corner, a term coined by legendary sports writer Herbert Warren Wind in 1958, geographically refers to the approach to the par-four 11th, all of the short 12th and the first half of the par-five 13th but many tend to think of it as all three holes in their entirety. "If you can get through those in level par you're a happy man," says BBC golf commentator Ken Brown. The 13th tee offers a rare moment of solitude for Masters hopefuls, on the furthest part of the course from the patrons. The 510-yard par five is the final hole of Amen Corner - but, unlike its unforgiving predecessors, offers a good eagle chanceGreg Norman, McIlroy, Spieth - just three of the names to have fallen victim to Amen Corner as their Masters dreams faded on the back nine on the final day.Spieth led by five shots approaching the 10th in 2016, but twice found the water on the iconic 12th to card a quadruple bogey seven - following successive bogeys on the 10th and 11th holes - to hand the advantage to eventual winner Willett.McIlroy's collapse came in 2011, his four-shot final-day lead already whittled down to one by the time the then 21-year-old reached the 10th.The Northern Irishman then followed a triple-bogey with a three-putt bogey at the 11th, before four-putting for a double bogey at the 12th and sticking his drive at 13 into Rae's Creek.Norman, meanwhile, took a six-shot lead into the final round in 1996, but shot a 78 to miss out on the Green Jacket to Nick Faldo by five strokes. Tiger Woods (2001 & 2002) is one of only three men - following Jack Nicklaus (1965 & 1966) and Nick Faldo (1989 & 1990) - to win successive Green JacketsAlthough the Masters began in 1934, the victorious golfer did not receive a Green Jacket until Sam Snead triumphed in 1949.However, Augusta members had worn the coloured coats since 1937, encouraged by co-founder Clifford Roberts, so patrons could easily identify "a source of reliable information".Once Snead received his Green Jacket, the coat became a symbol of success - and is now one of the most iconic prizes in sport.Winners are allowed to take the jacket home for a year and are rather generously allowed to wear the single-breasted, lightweight jacket "in public during that time on special occasions".After that, past champions have a custom-tailored coat waiting for them on their return to the Augusta clubhouse. "It felt like my old friend was back on my shoulders," said 2013 champion Adam Scott when he returned a year later.